It is very common for our family to cook up pork chops when we have family and friends over. Pork chops are easy and delicious to prepare. I enjoy to cook them with a simple rub or marinade. 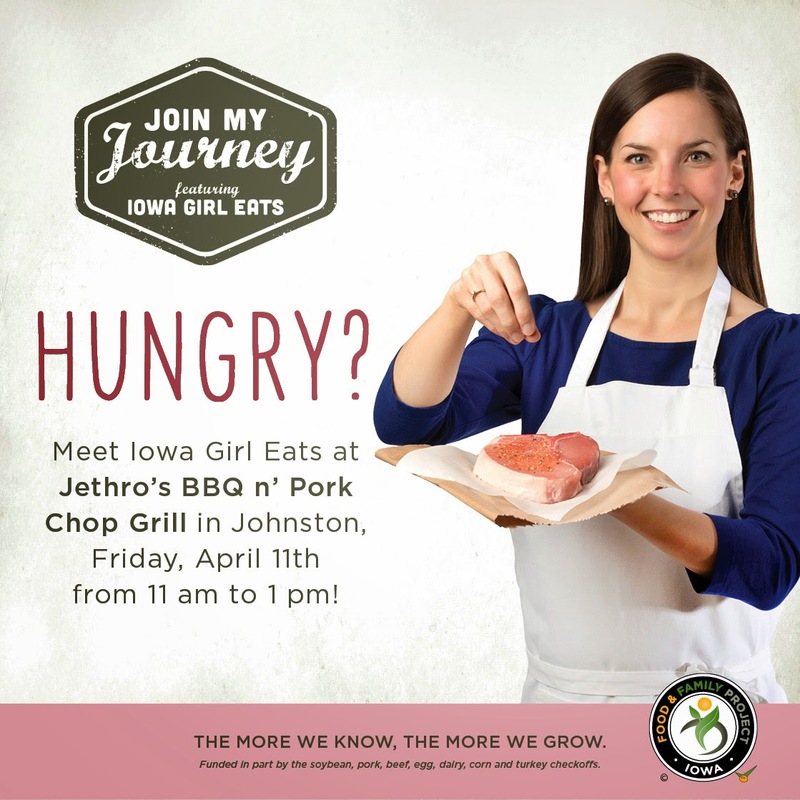 I love cooking pork and sharing about our hogs at home, and tomorrow I'm excited to share about pork at Jethro's BBQ n' Pork Chop Grill in Johnston as part of the Iowa Food & Family Project's "Join My Journey" program. I'll be joining Kristin Porter, Iowa Girl Eats (pictured above) and Nicole Patterson, Farm Girl Facts of Life at the event from 11am to 1pm. If you are in the Des Moines area you should stop by for lunch, eat some pork and register for prizes! 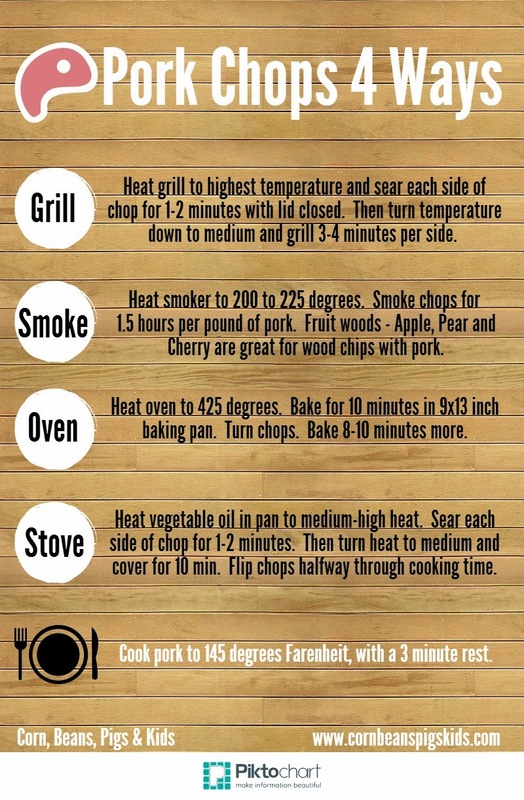 What is your favorite way to prepare pork chops? Remember to Comment for a Cause! This is great. I love the Food & Family project - I was an Iowa Girl Eats fan before, but I love her even more for giving her voice to farmers. Love it! I couldn't agree more! I think the "Join My Journey" program is a great way for Iowans, and really people from across the nation, to learn about farming, agriculture and food. I hope to get to come and see you tomorrow! I am craving some pork chops in a major way now after reading your recipe guide! I love mixing up the different woods when smoking pork. So delicious! I hope to see you. Make sure to flag me down if you make it! Well, Baconfest didn't get my participation, but we eat lots of pork at our house. Our granddaughter will eat bacon every day! I buy unsliced pork loin, split it into roasts and then I can do lots of cooking methods. Tonight is pork and veggies stirfry! I love mixing honey, teriyaki and garlic and marinating them, and then cooking them on the stove. SO good! We love porkchops and would eat them any of these four ways! I love them too - so versatile! I am not a huge fan of pork chops but my husband loves them breaded and fried. Breaded is another great way to prepare pork chops and is a favorite in our house. Pork chops are one of those things I don't make that often but enjoy when we do. This reminds me I should make them again soon. Thank you! My guys love pork chops and I can never have enough ways to make them. I love to hear that you have some pork chop fans in your house! Pork chops are so delicious and versatile. We definitely eat chops all four ways. We do too. Pork Chops can be delicious and juicy if cooked properly. I don't make pork chops very often, but just breaded them in pretzels last week which was a hit! That sounds delicious! I'm going to have to try that soon. You can't go wrong with pork chops, these are great ideas. I love to grill them and top with fresh mango or pineapple salsa.